The Stamford Pizza Tour began as the product of our curiosity. Having lived in Stamford all of our lives and eating pizzas as "20-somethings" tend to do, it occurred to us to try all of them in rapid-fire succession and find out where the best pie comes from. So, we drew from our past efforts, put together a hilariously complex rating system, and hit the road equipped with nothing but our perfectly unrefined, pizza-loving taste buds. About seven restaurants in, we decided to somehow translate our "findings"—four dog-eared, grease-stained scoresheets clipped into 83 cent clipboards and covered with an incomprehensible array of numbers—into something more a bit more substantial (and a helluva lot more useful). Soon, stamfordpizzatour.com was born. Complete with a little map, a few quippy reviews, and a growing list of Pizzas to be Toured, this site had spun our latest boredom-fueled venture into a marginally relevant, quasi-authority on pizza in The City that Works. We praised the good places, panned downright horrible ones, and were admittedly torn amongst the ones we couldn't quite come to a consensus on. Polarizing as most (if not all) reviews are, some readers agreed with us and some readers didn't, but in the end, we stayed true to our goals and found a phenomenal pizza that we certainly would have overlooked had we not visited all 50+ pizzerias in our fair city. This is not to say that you'll certainly agree with us, because that, after all, is the nature of opinion. o-pin-ion \ə-'pin-yən\ n., : 1. a belief or judgment that rests on grounds insufficient to produce complete certainty. 2. a personal view, attitude, or appraisal. But why should you listen to us? What are our credentials? Why does our opinion even matter? Well, it doesn't have to matter to you. 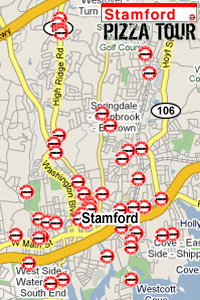 The Stamford Pizza Tour is not gospel; we have never and will never make that claim. We do, however, have the unique distinction of having been to every restaurant in Stamford with a pizza on their menu in a relatively short amount of time. We were able to compare and contrast the best this town has to offer with the same outlook and the same intent as anyone else who wants to go out and eat a damn good pizza. We're not food critics, we just have a website. We haven't been trained in the culinary arts, and even if we were, you probably shouldn't have trusted us any more or any less. Pizza is street food, it comes in a box and can be eaten off of paper plates while standing up without the use of any utensils whatsoever. No one needs to be educated at Le Cordon Bleu to wrap their heads around which pizza tastes good and which one tastes like the box it came in. Anyone can judge a pizza and this little patch of the internet that you've stumbled upon is proof. So what have we done here? We set out to find one really good pizza in Stamford and we found many. We spent six months getting reacquainted with a city we thought we knew well and discovered restaurants we'd never seen before. We met a wealth of talented, personable restaurant owners and their staffs, and we were able to give them credit for their hard work while having a lot of fun doing it. Moreover, we set out to present our opinions in an informative, entertaining format, giving the layman's food review a bit more dimension than, "that pizza's so good," and we believe we've accomplished that as well. We might be out of restaurants, but we're not going anywhere. Stay tuned to see where the next leg of the Stamford Pizza Tour takes us.